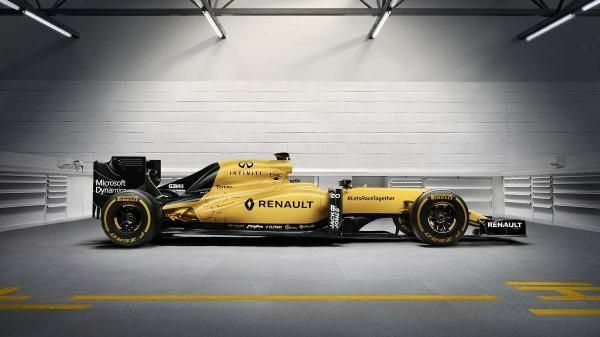 Revealing it's new Formula One livery, Renault Sport created a beach-themed video to go along with its yellow and gold on black color scheme for the year. The video begins with two principal drivers, Kevin Magnussen and Jolyon Palmer, sitting on the beach and checking out Australian pro surfer Ellie-jean Coffey. Set on Boat Harbor Park Beach near Sydney, the video shows the surfer beckoning the Renault drivers to come join her in the water. Donning their race helmets and handing one to Coffey, the three are then seen on a giant paddle board, with the surfer behind the wheel of the new Renault Sport Formula One R.S.16 car. After its alliance with Red Bull Racing ended, Renault teamed with Renault-Nissan Alliance member Infiniti and its sport arm to continue in F1 racing. Infiniti is a technical partner, offering expertise in hybrid powertrains and racing development. A team of Infiniti engineers have made the move from Japan to France to further the alliance with Renault Sport.